Model T Ford Forum: 24 Coupe? Model T Ford Forum: Forum 2014: 24 Coupe? My Grandpa always talked about his first car, I believe he said it was a 24. I remember he talked about switching bodies at one point. Looking for the experts to give me any info on the car in the picture. Thanks in advance.. It looks like a '24 T coupe. The car looks a bit beat up. Do you know when when the picture was taken? The wheels are interesting. While they appear to be steel disc wheels, they also appear a bit flat. Looking under the car to the left front wheel, we can see the spokes of a standard wood spoke wheel on the inside of that wheel. There were so many accessories for model Ts back in their day, and some you could make yourself. One such accessory was thin steel discs that mounted onto your wood wheels to give the appearance of full steel wheels for a fraction of the cost. These kits came in several variations from very plain to quite fancy. Many only had four discs to mount one on the outside of each wood wheel. Some sets had eight discs so one disc would be used on the outside and another would mount on the inside of each wheel to totally cover the wood spokes. The inner discs had a fairly sizable hole placed to be over the tire valve stem so air could be put in. For some of these sets, the wheels had to be somewhat disassembled to put all the discs in proper placement. Some of the cheaper sets had only the one disc per wood wheel, and it simply bolted onto the steel felloe under the demountable rim lugs. Some of these had a larger center hole that fit around the wheel hub flange (not bolted down). Others had smaller center holes that simply covered most of the hub. Some of the better sets had fancy hub covers in addition to the wood spoke covers. Wayne, the picture was taken in 1934, my Grandpa was 19 years old. I just wanted to see if the car was in fact a 24. Looks to me like the front of the pass rear fender is too close to wheel. Yes it does look kind of beat up. I once read that once the Model A came out the T's were a $5.00 car, but if memory serves, he paid a lot more for this car than that. I think people in rural Wisconsin were behind the times a bit back then? I don't know. To tell ya the truth, I'm just proud that I was able to resize and post the picture haha! The rear fender on most pre'26 Ts usually do look a bit close the the front of the rear wheel. I sometimes wonder how they manage to not hit going over uneven ground. The 1924 and '25 Ford coupes look very much alike. There are some minor and significant differences in the body construction which cannot be seen in a photo like this. The reason I would say it is most likely a '24 is, again, the wheels (not having anything to do with the steel covers). In '24, the only Ford options were clincher wheels and tires (almost always the 30X3.5 demountables). 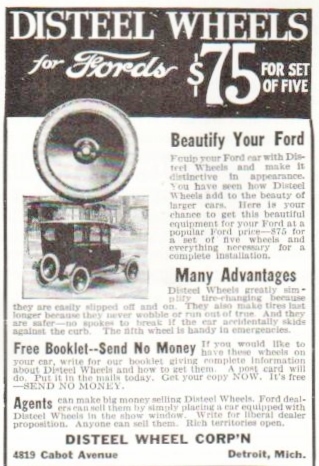 In 1925, Ford offered a newer type 21 inch split rim balloon (we can laugh, but that is what they were called) tire option. 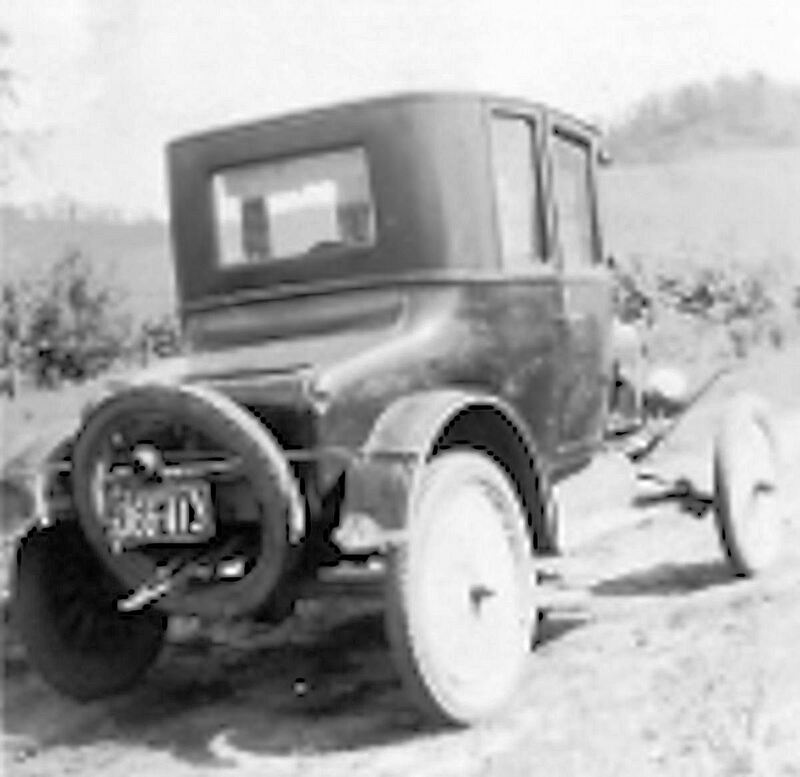 Although the clincher rims and tires were still available in all of 1925, it appears that very few car (at least in the closed cars) were sold with them. A fair number of tourings and runabouts were sold with the clinchers throughout '25, but they were the cheaper cars, with the cheaper wheels. The enclosed cars cost a bit more, and most people that could afford that bit more also paid the few extra dollars for the up-to-date look and comfort of the balloon tires. Wonderful to have such a nice photo of family! At last I have found the answer to my question (I think). 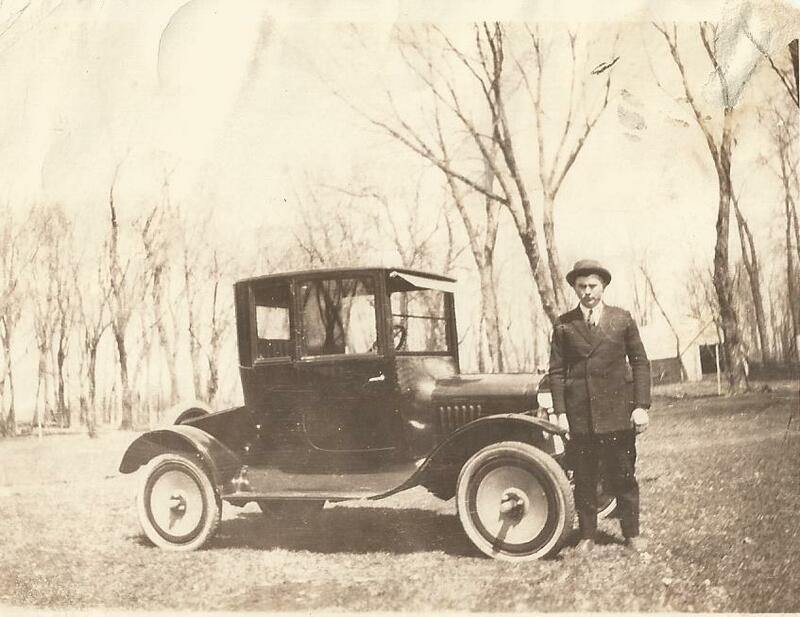 I am attaching a photo of my grandfather with his car. I noticed that the wheels were not spoked like most of the others I have seen. Are my grandpa's wheels like Brian's grandpa's wheels - with wheel covers over the spoked wheels? What is the rational behind adding wheel covers? Do you agree that this is a 1924 Ford Coupe? 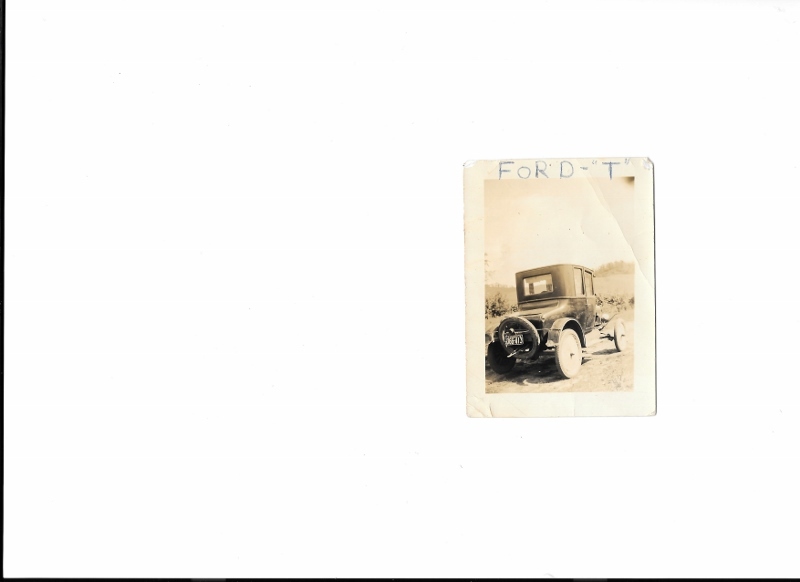 Backstory: I have this picture and Grandpa's State of Iowa Registration for a 1924 Ford Coupe, engine #10847606, purchased new on 11 Dec 1924 for $525. He married my Grandma on 30 Nov 1925 and they left immediately for a 5 month road trip to the western US. They sold the car in California (probably the Lodi or Stockton area) and it is said that the person that bought it was later killed in a car accident with it. Your Grandpa's Coupe is more likely 1922-23. The turtle deck (trunk) is flat and it has suicide doors. 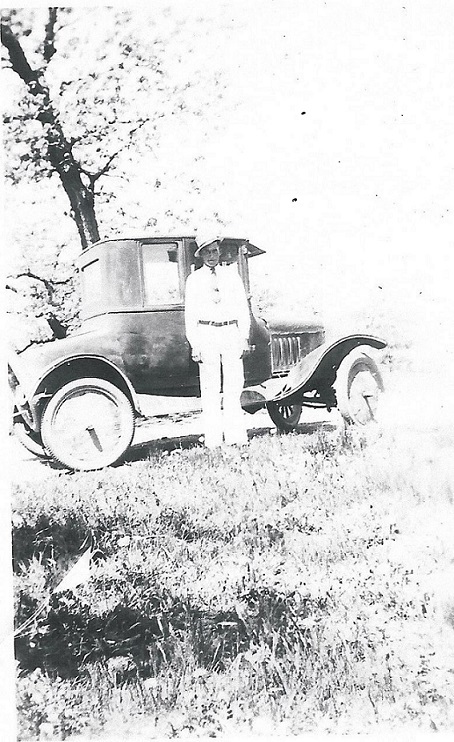 Kristin -- To expound a bit on Dennis' remark: Grandpa's car in the picture is a 1923 or earlier, possibly back to 1919. The 19's and 20's had different door handles, but on an accessorized car like that one, with the disc wheels and sun visor, the door handles might have been changed to update it. Changing them would be easy. The registration you found is for a different car. The car number 10847606 was assembled late in November of 1924, making it a '25 model year car, even though it was titled as a '24. Titling cars as the calendar year when they were built and/or sold, rather than the manufacturer's model year, was the norm back then. Maybe Grandpa traded in his '21/'22/'23 on a brand new '25! The wheels on the photo of that coupe of your grandfathers aren't simple accessory metal disc's bolted on over the Ford spoke wheels. 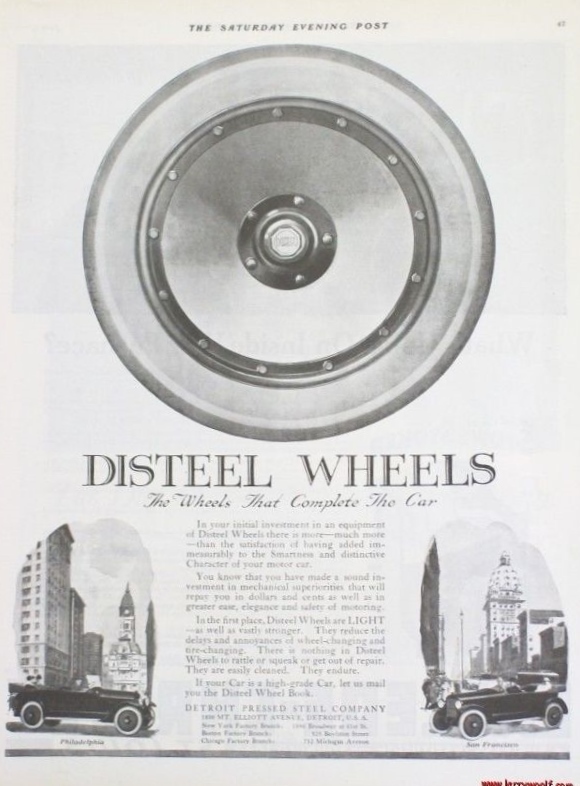 Those are Disteel brand wheels, made just for the Ford by the famous company that made disc wheels for all the larger cars of the day. Brian your pic of the T Coupe is definitely a 24. It has front hinged doors. That is the tell tale difference between the earlier and later styles.